A week of preliminary UN climate talks in Bangkok come to a close today with little concrete progress to show for it. 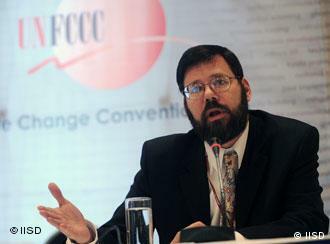 With just two months left until much-anticipated negotiations in Copenhagen, it will be "extraordinarily difficult" for the U.S. to agree to specific emissions reduction targets in an international climate treaty, warns the United States' deputy climate envoy Jonathan Pershing (pictured right). [T]he chief U.S. negotiator acknowledged that the United States may not agree to cut greenhouse gas emissions in a treaty this year until Congress passes its climate legislation. "It will be extraordinarily difficult for the U.S. to commit to a specific number in the absence of action from Congress," State Department deputy climate envoy Jonathan Pershing said. "The question is open as to how much we can do. It's not really possible to answer." Some progress was made in Bangkok, said Kim Carstensen, leader of the global climate initiative at WWF. But "on issues that require political breakthroughs, they've not made any real progress," she said. "That means targets, finance, institutions and the legal form of the outcome in Copenhagen." While efforts to drive towards global agreement on binding emissions targets stall and both the United States and key developing nations, including China and India, balk at such proposals, a series of recent recommendations are establishing a growing consensus for an alternative to the targets and timetables approach that has repeatedly failed to make either political or substantive progress. This emerging climate consensus would scrap the Kyoto Protocol's focus largely-symbolic emissions targets and timetables in favor of specific, actionable national commitments to the two things that actually drive down global emissions: accelerating the deployment of clean energy and the improvement of energy intensity in key sectors of the economy. Alongside real commitments from the world's rich nations to help provide financial and technical support to speed the diffusion of clean technologies to the world's poorer nations, this more direct framework can build off of policies already underway in key nations, including the U.S., China and India, and result in far more concrete climate action than the empty commitments to symbolic emissions targets. "Only Technology Policy, Not More Targets and Timetables, Can Save Copenhagen"
"How to Get Climate Policy Back on Course: New Report Proposes Post-Kyoto Framework for Copenhagen"
"IEA Sends Message to Copenhagen Delegates: $10 tn Needed to Combat Climate Change"
"New "National Schedules" Proposal Could Change International Strategy in Time for Copenhagen"